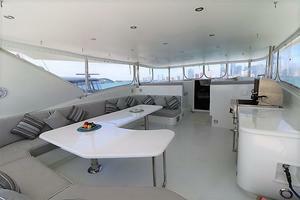 Trident was the naval architect involved in the professional vessel composition for AKIM. 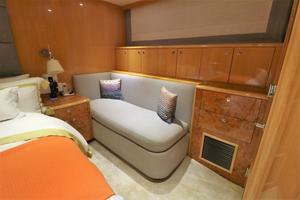 Her interior design was completed by Lauren Currell. 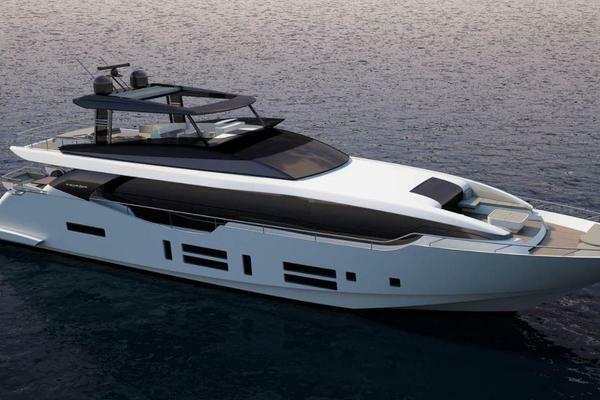 Trident and Sergio Cutolo and Baglietto is also associated with the yacht wider design collaboration for this yacht. 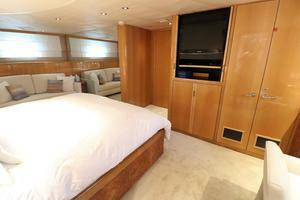 the United States is the country that Trident Shipworks built their new build motor yacht in. 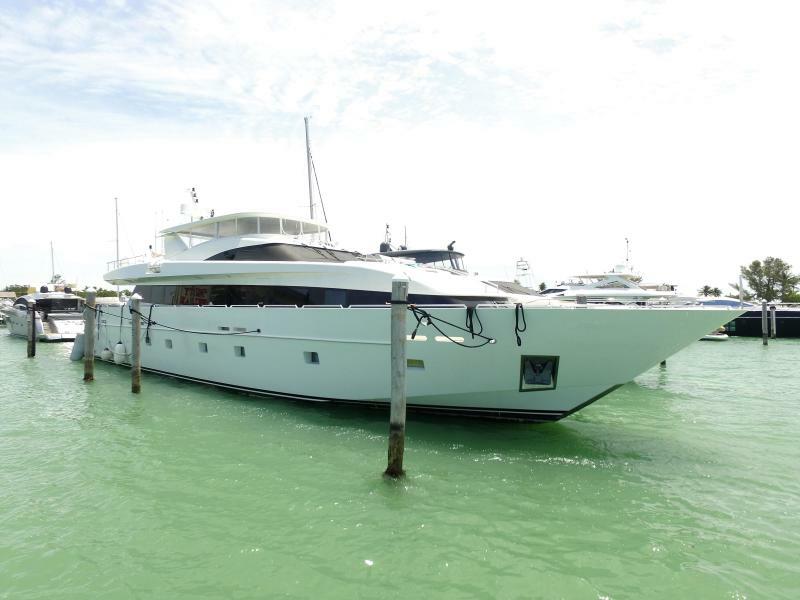 After formal launch in 2000 in Tampa Fl she was thereafter delivered on to the proud new owner having completed sea trials. 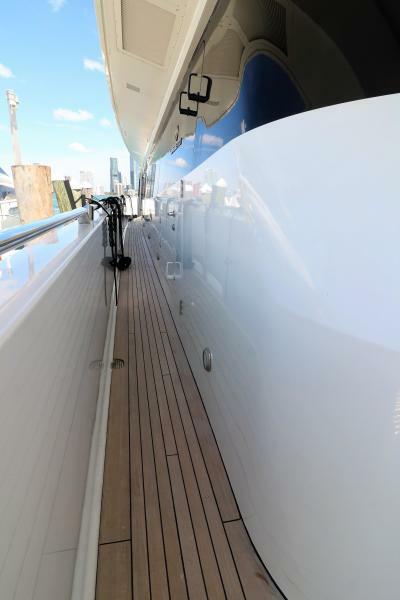 Her hull was crafted from composite. 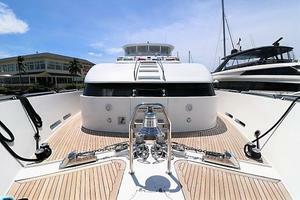 The motor yacht main superstructure is fabricated predominantly from composite. 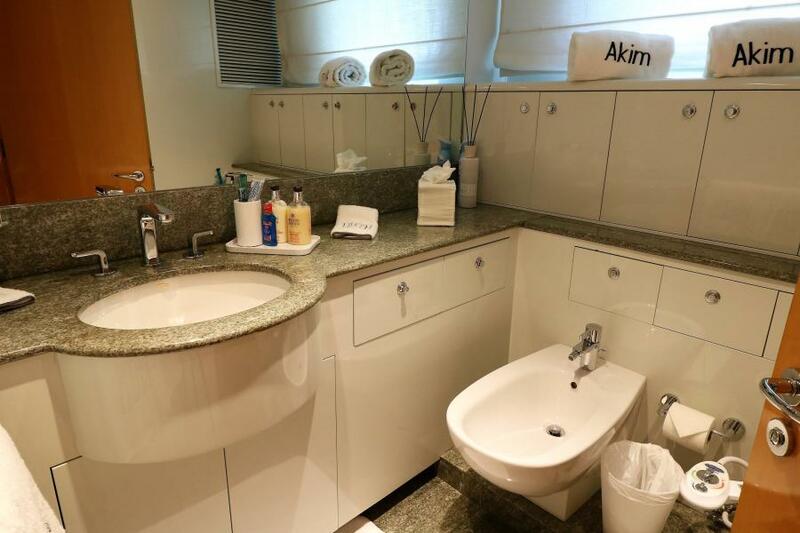 With a beam of 7.19 metres or 23.6 ft AKIM has reasonable internal space. 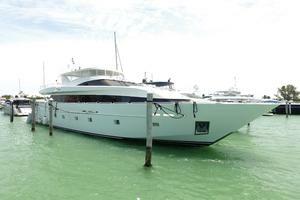 She has a shallow draught of 1.83m (6ft). 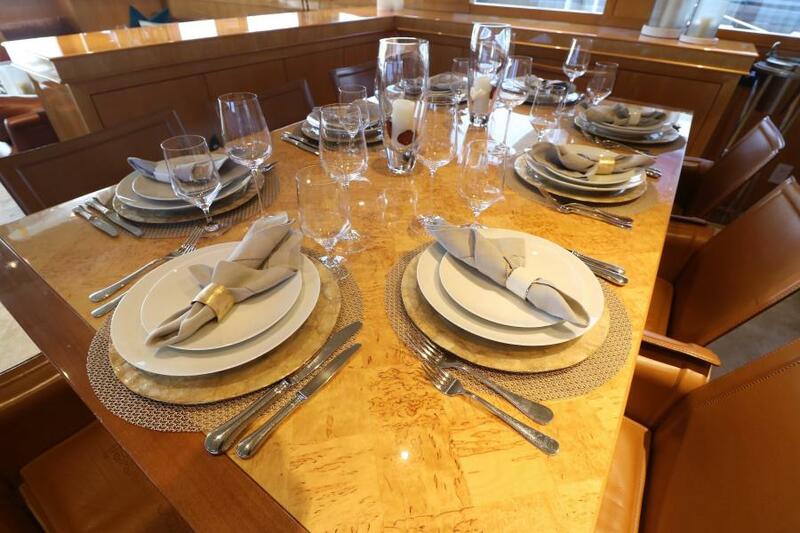 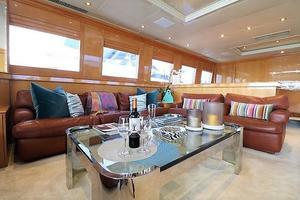 The good sized luxury yacht M/Y AKIM can accommodate up to 8 guests and 5 professional crew. 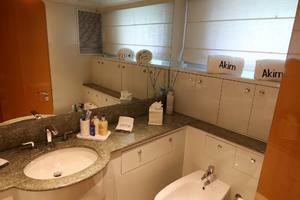 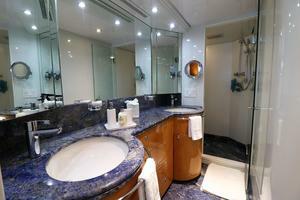 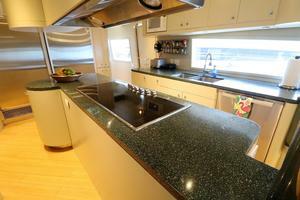 -2014 FULLY RENOVATED AND UPDATED ON ALL EQUIPMENT'S AND INTERIORS. 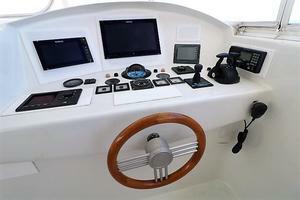 -2018 UPDATE ON NAVEGATION & ELECTRONICS EQUIPMENT'S. 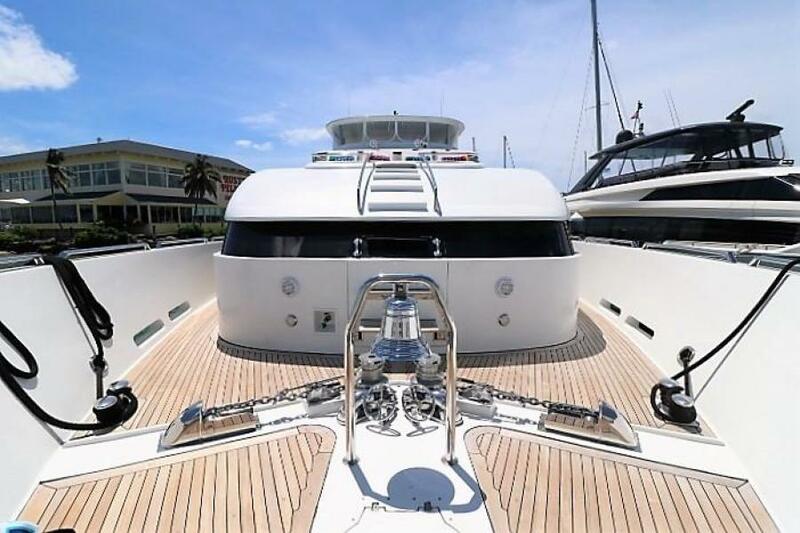 -2018 FULL OVERHAUL ON ENGINE'S. -2018 NEW GENERATOR'S 0 HOURS. 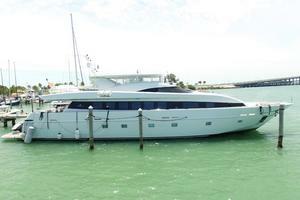 United Yacht Sales New Jersey would love to guide you through a personal showing of this 105' Baglietto Trident 2000. 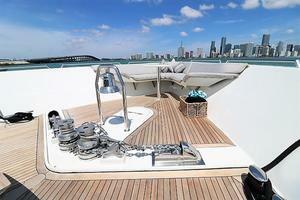 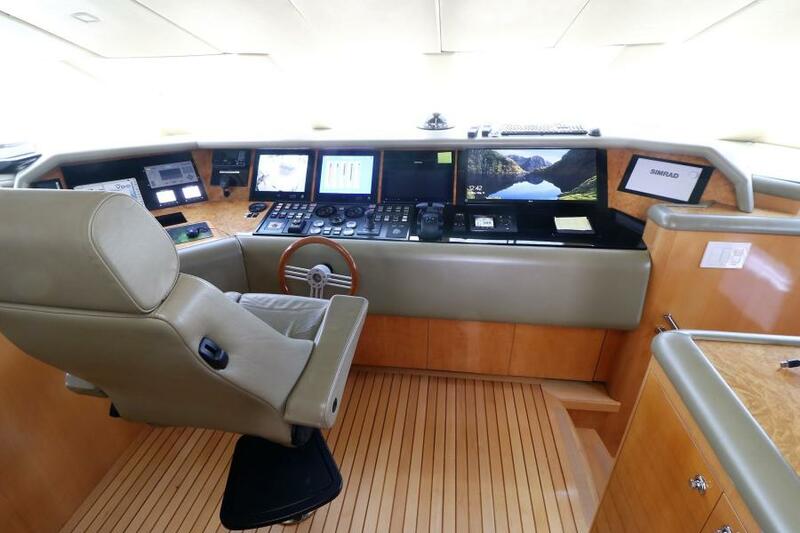 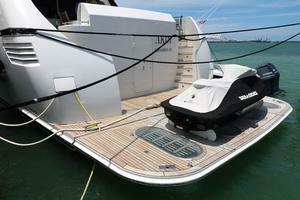 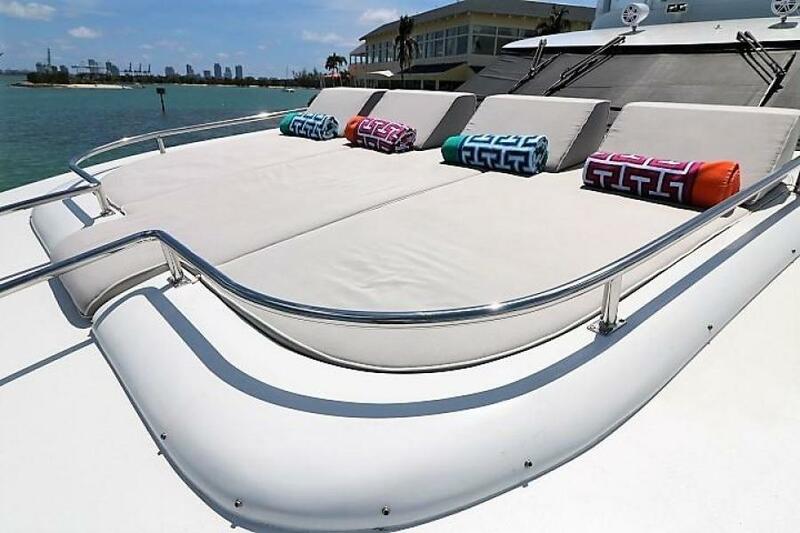 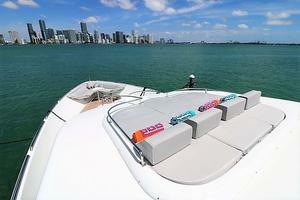 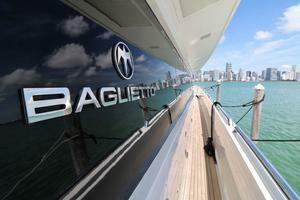 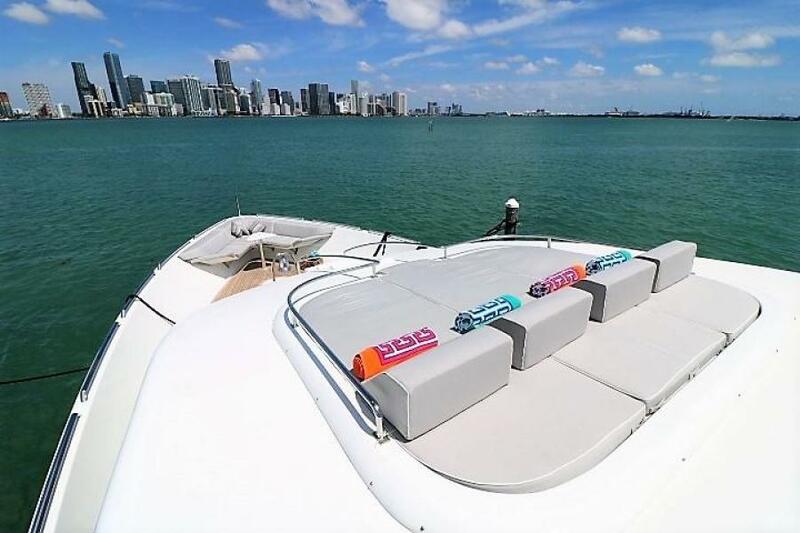 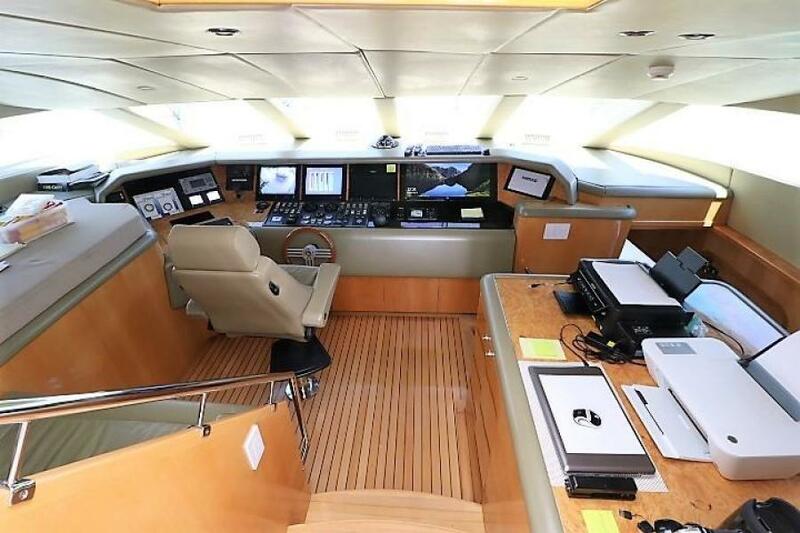 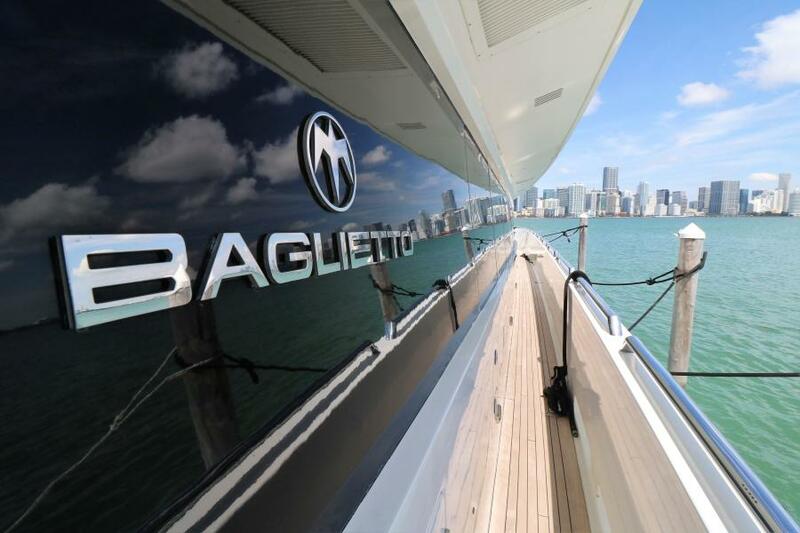 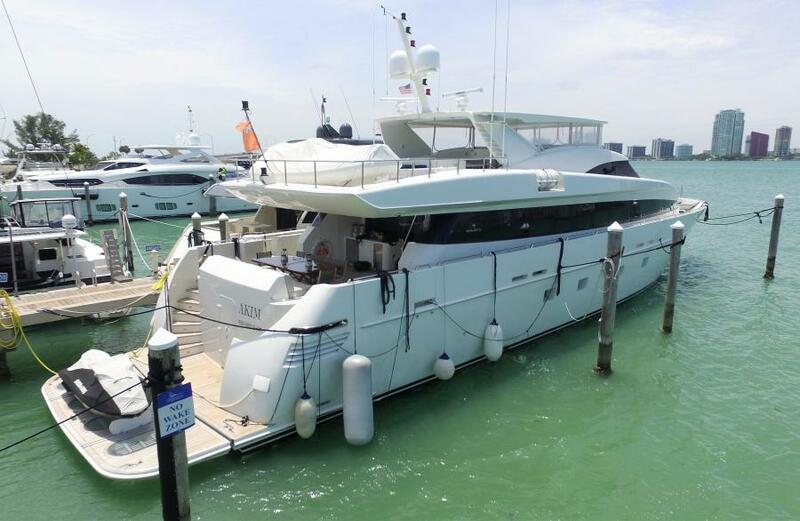 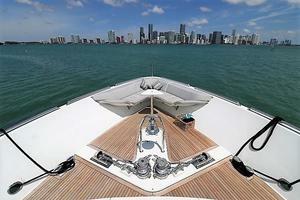 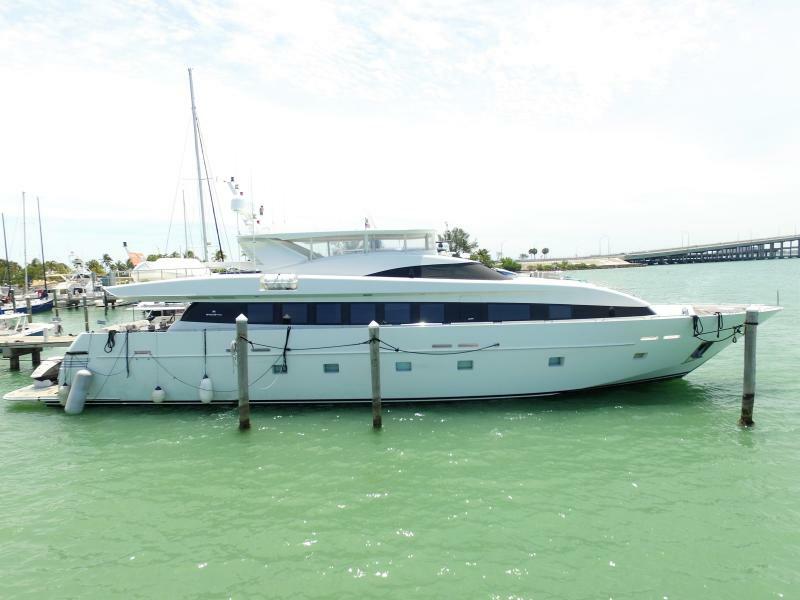 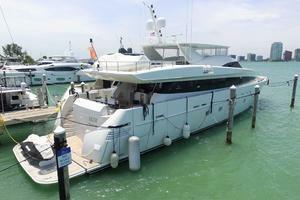 This yacht for sale is located in Miami, Florida and priced at $4,399,000. For a showing please contact us by filling out the form on this page and we will get back to you shortly! 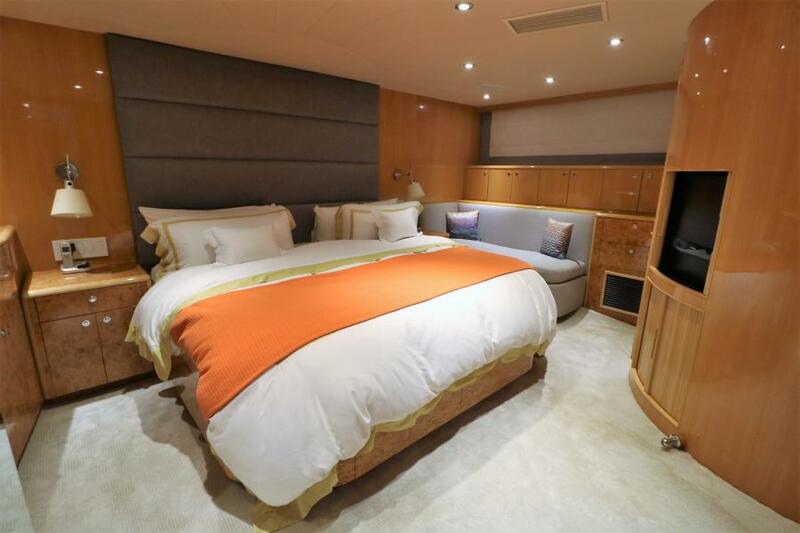 This magnificent boat sleeps ten (10) in the owners party in four staterooms plus five to six crew. 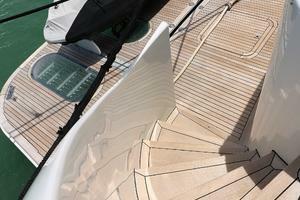 Boarding ladders on either side of the vessel allow for easy access. 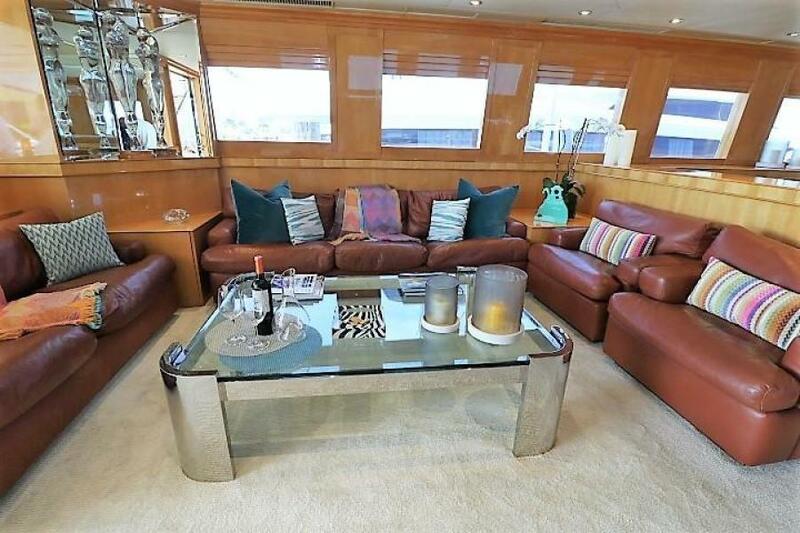 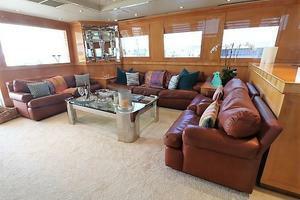 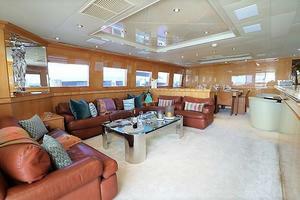 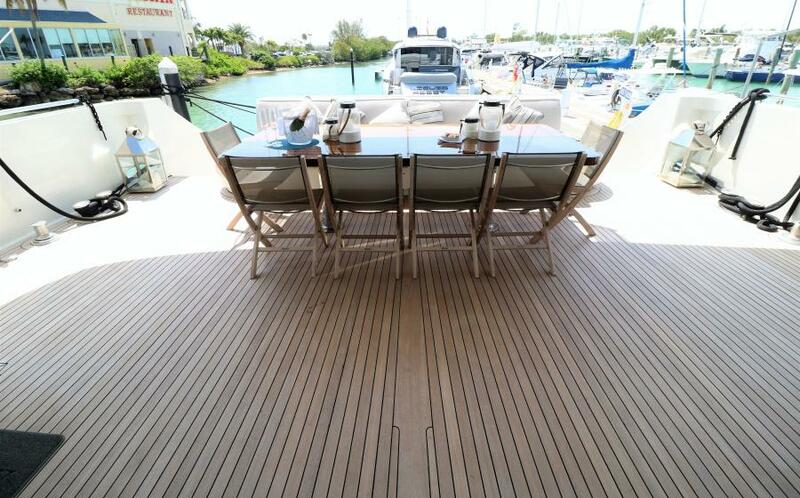 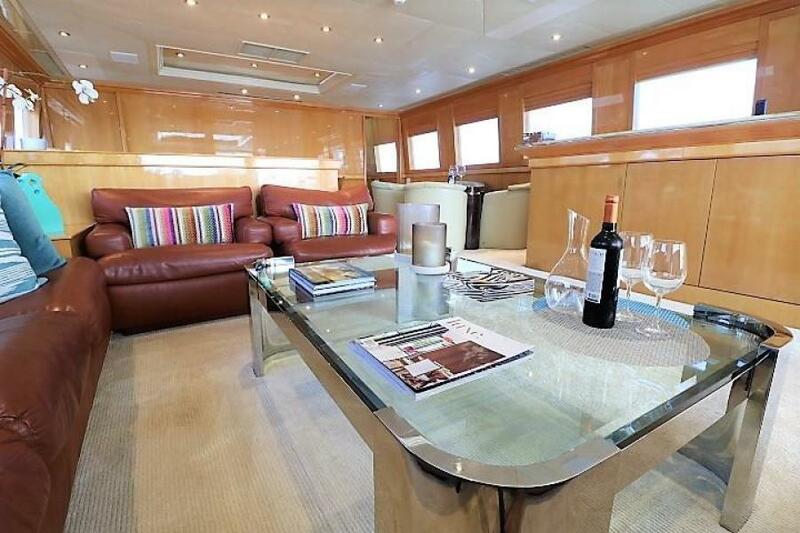 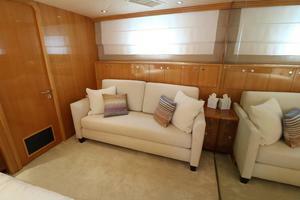 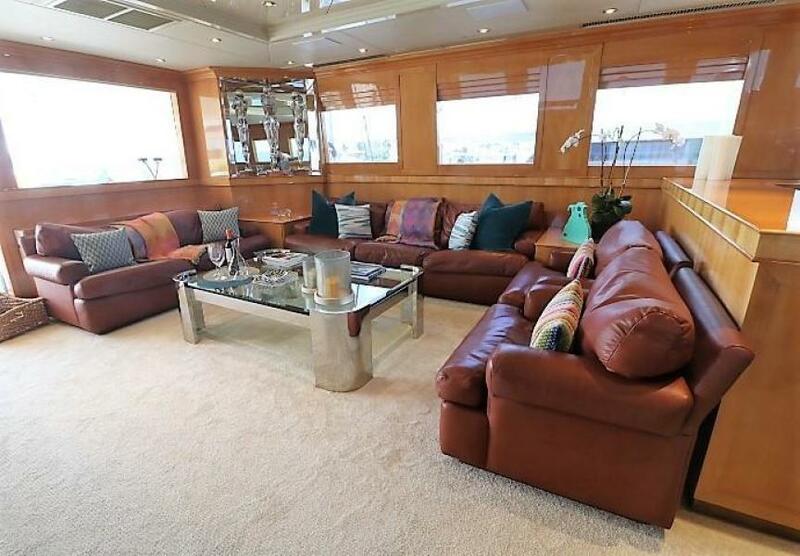 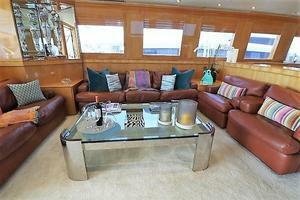 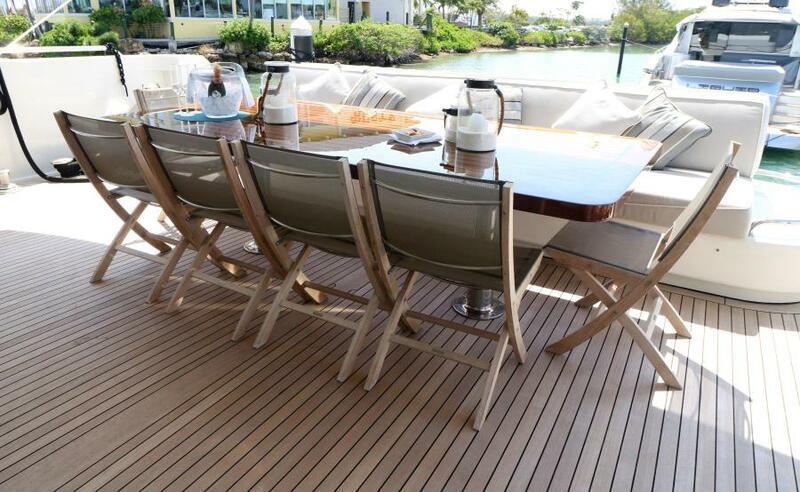 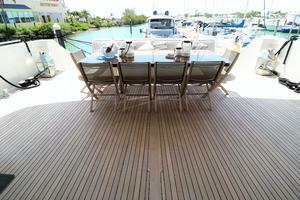 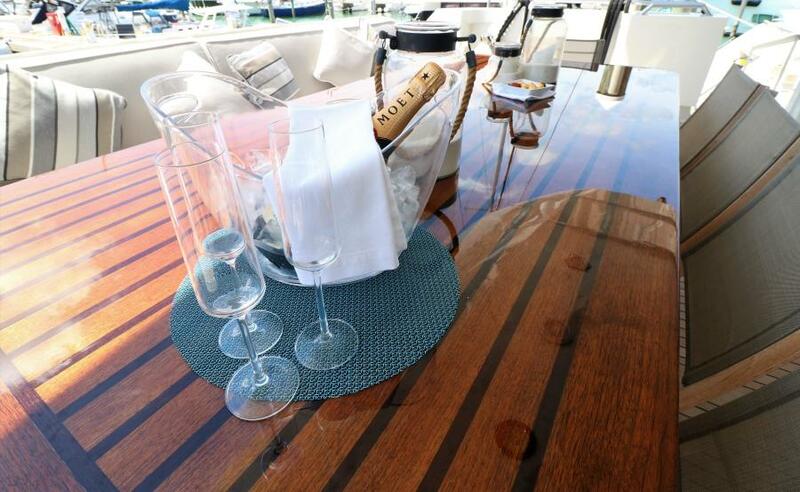 The spacious aft deck features a large sofa across the back with a large teak table and chairs. 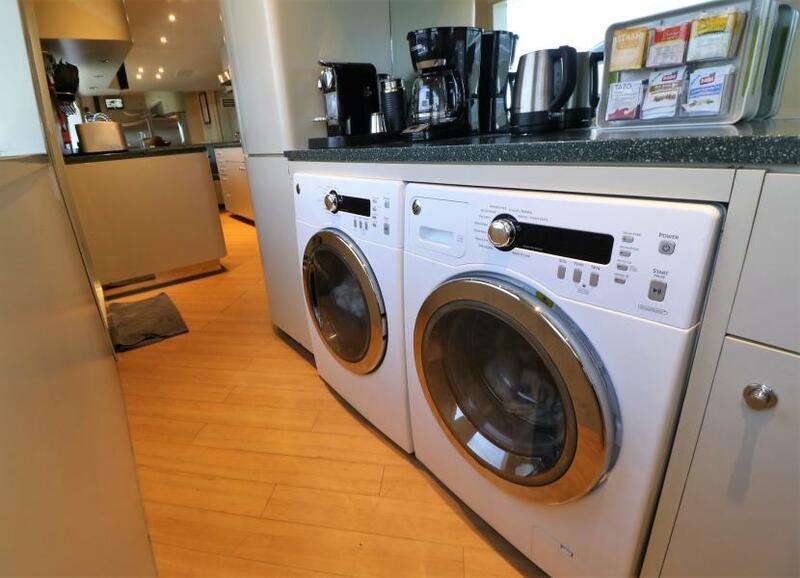 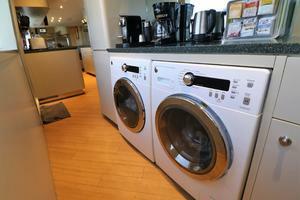 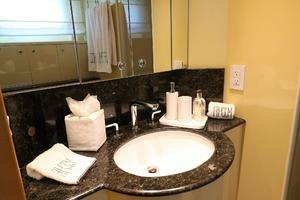 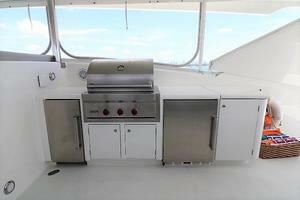 Other amenities include a full wet bar, ice maker, refrigerator and 4 speakers. 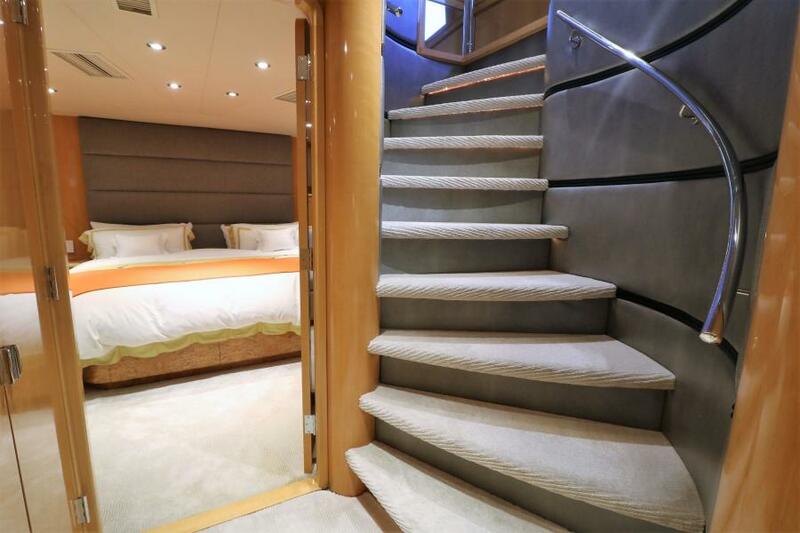 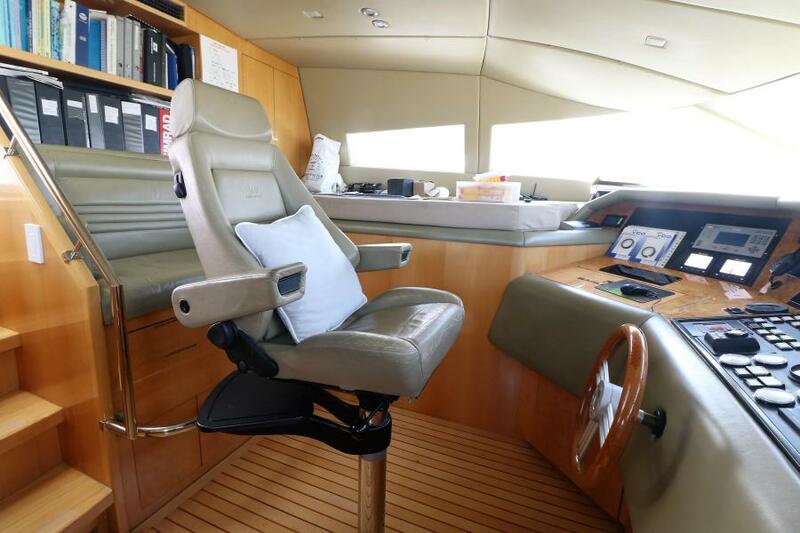 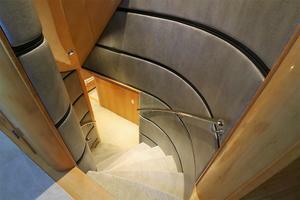 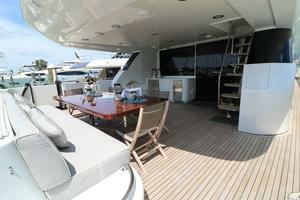 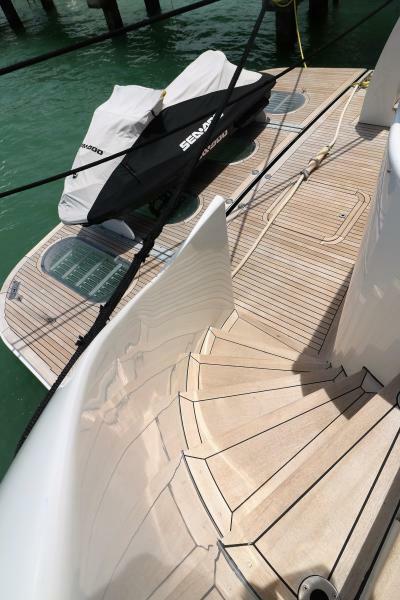 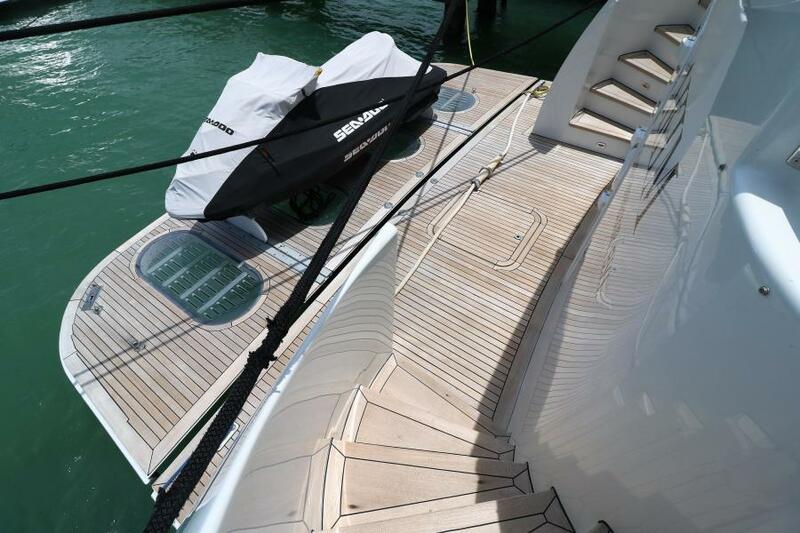 From the aft deck, there is a staircase on the starboard side for access to the flybridge. 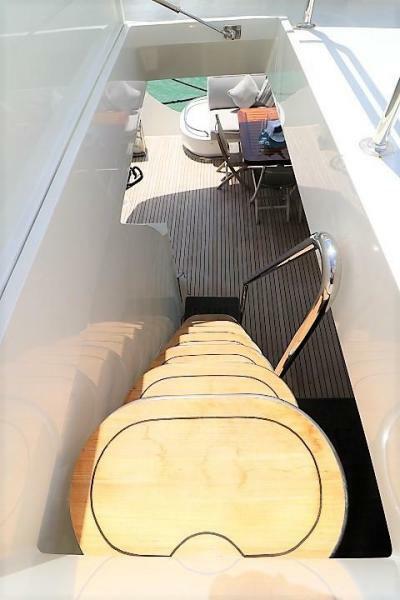 Circular stairs on both sides (starboard and board) of the aft deck lead down to the swim hydraulic platform, there is also an access to the engine room. 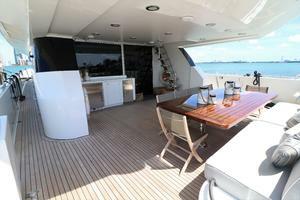 Moving forward from the aft deck is the Main Salon, which is entered trough a sliding glass door. 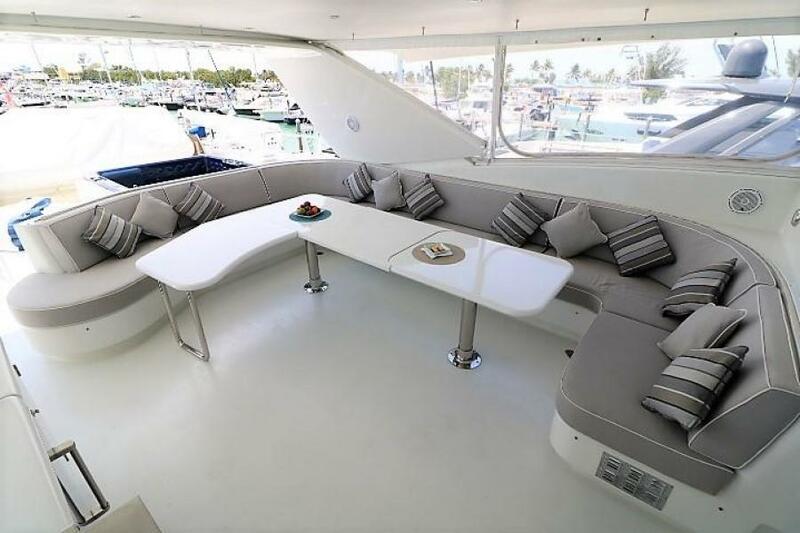 Sofas along the back and side (board) provide comfortable seating. 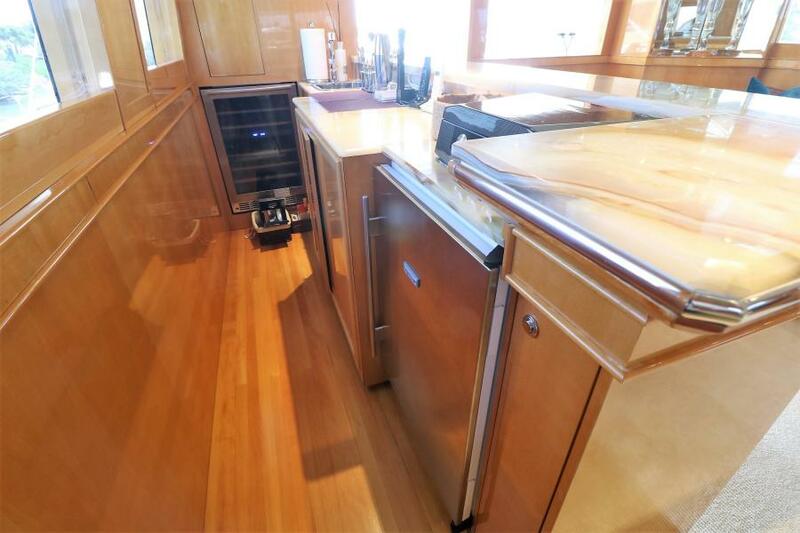 The starboard side of the salon includes a bar with ice maker, refrigerator, sink and wine cooler, and ample storage for bottles and glasses. 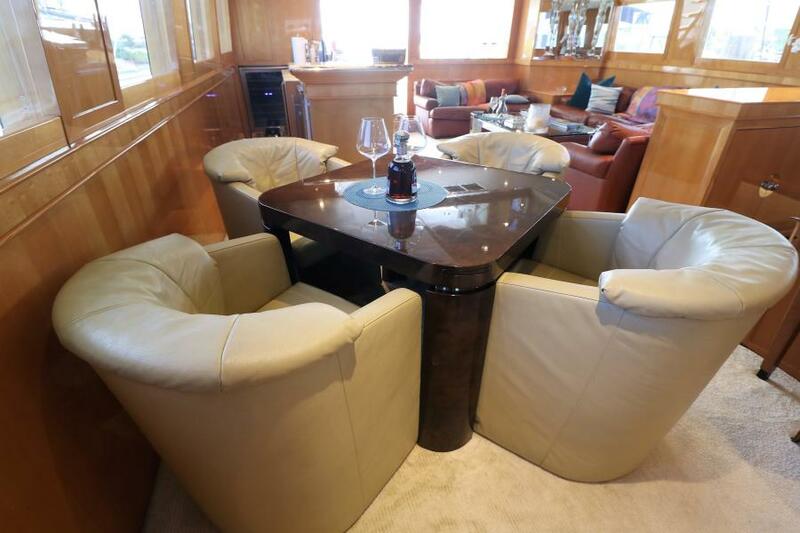 Continuing forward is the Dining Salon which has seating for eight people, a storage/serving counter which wraps around to the port side separates the dining salon from the main salon. 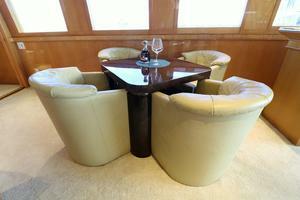 A small game table with four chairs is opposite the dining table. 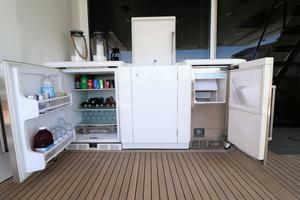 Forward at port side is the access to Laundry/Pantry. 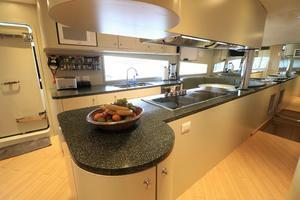 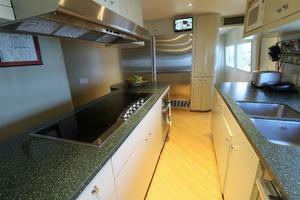 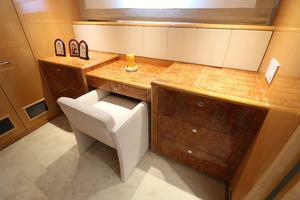 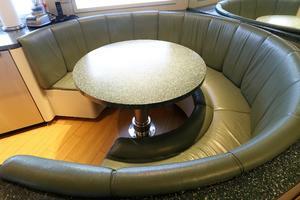 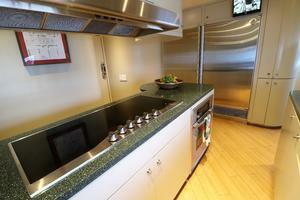 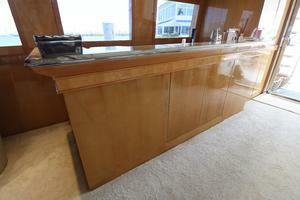 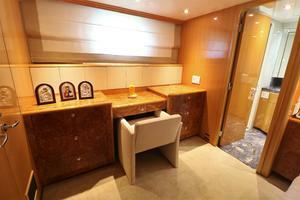 The full service Galley features a C-Shaped dinette and television. Forward on starboard side is an on deck day head, a stairway leading to the pilothouse and other stairway leading to the guest staterooms. 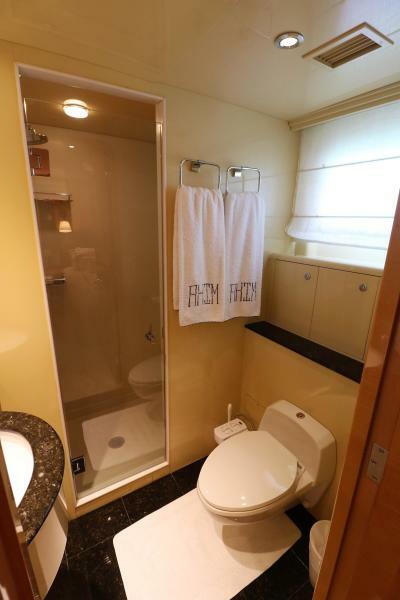 Captain cabin access is trough the Galley with queen bed and full private head, the crew quarters access is trough the Galley down a stairway and include two cabins with upper/lower berths each one with a head. 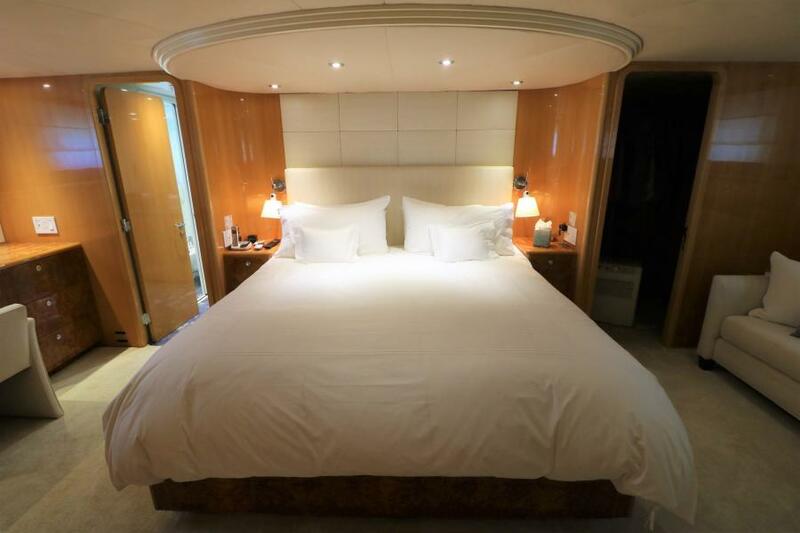 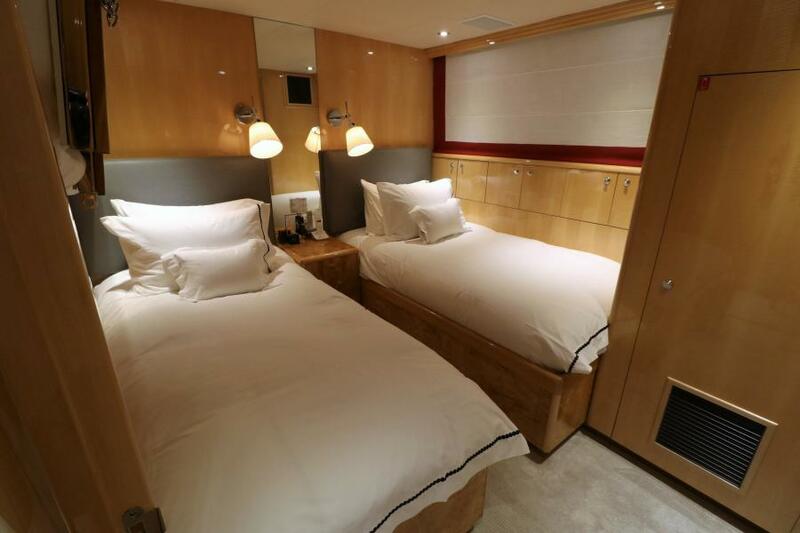 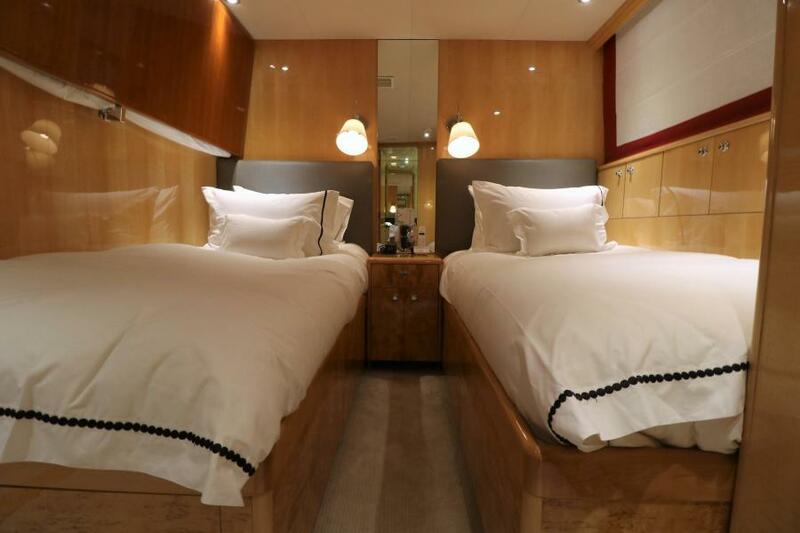 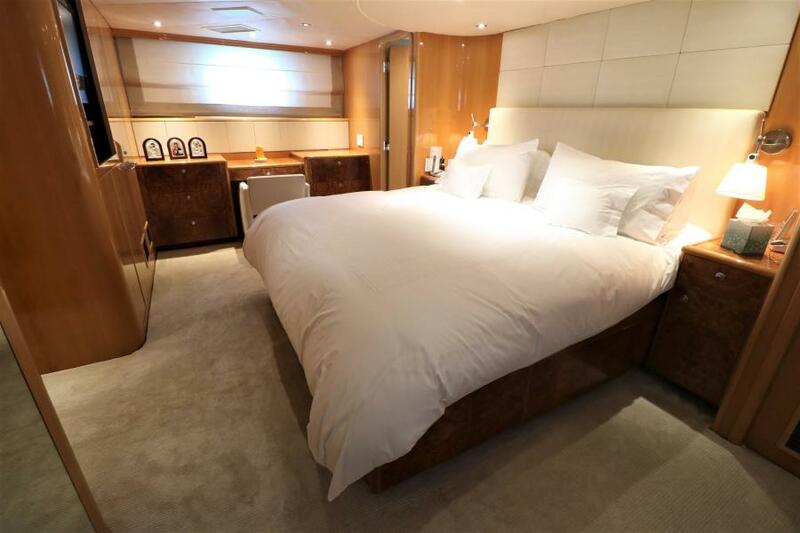 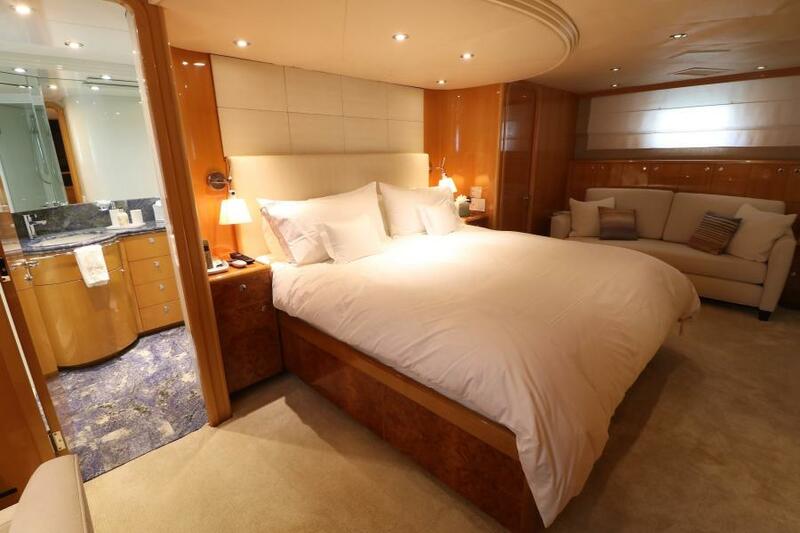 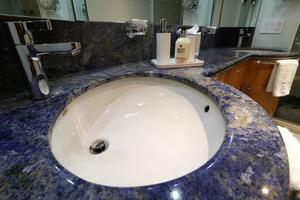 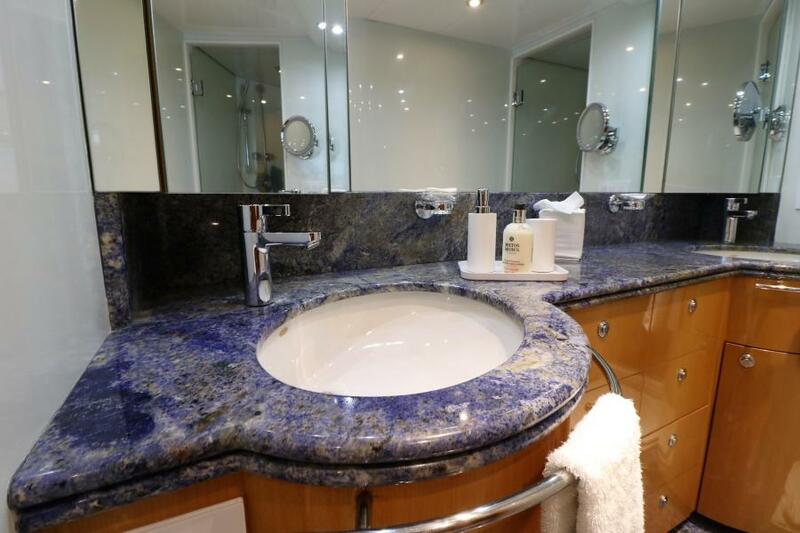 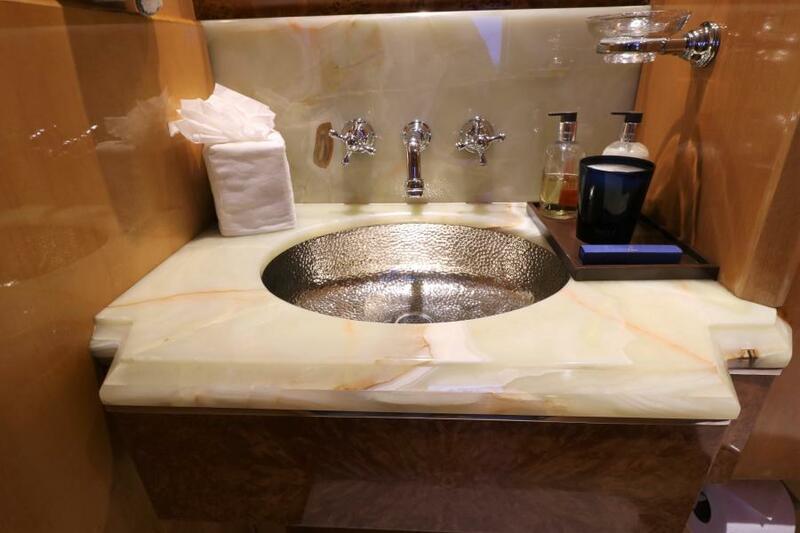 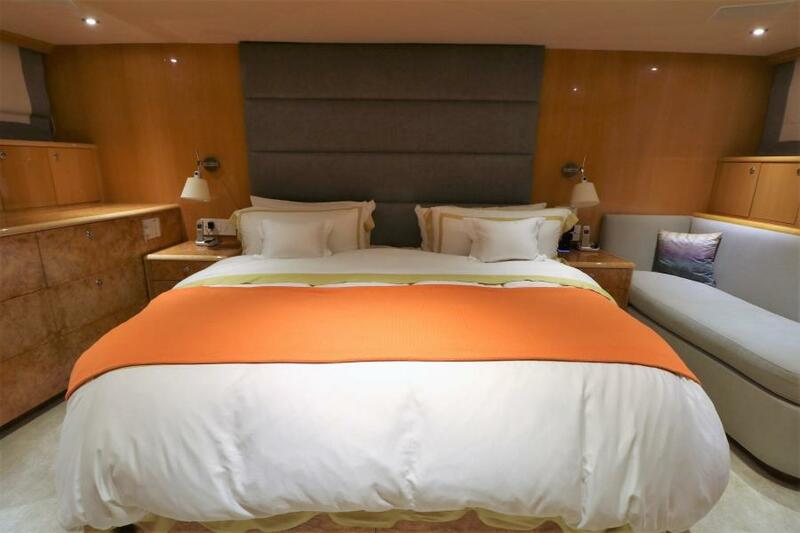 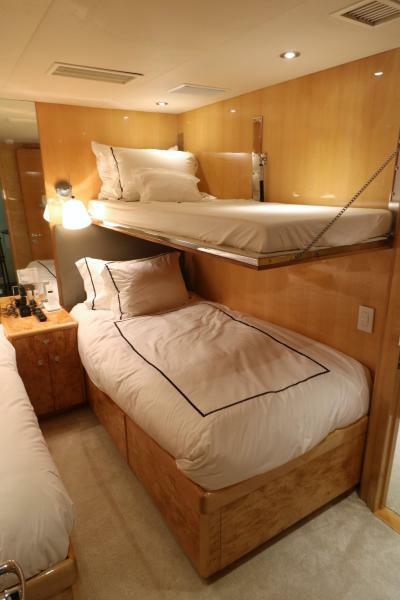 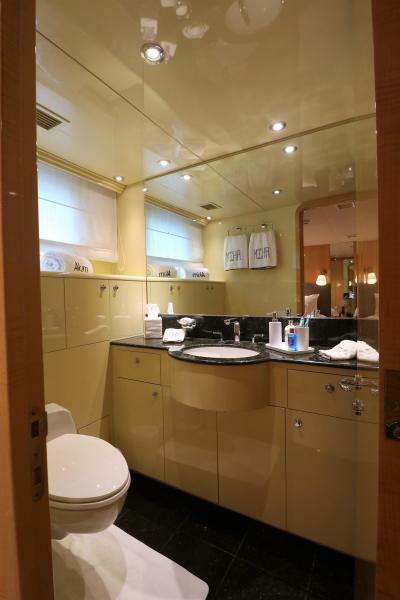 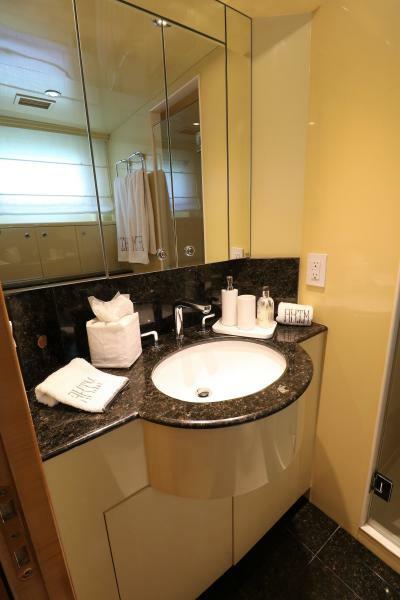 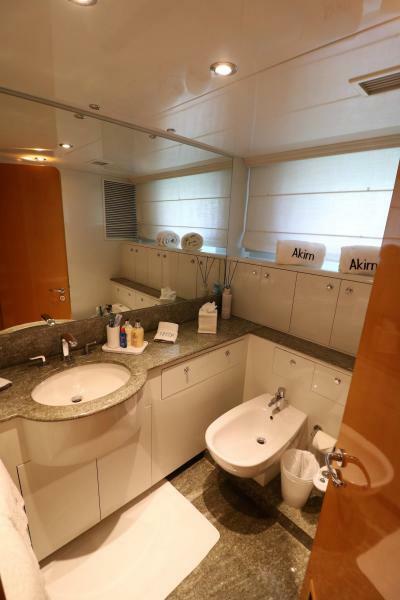 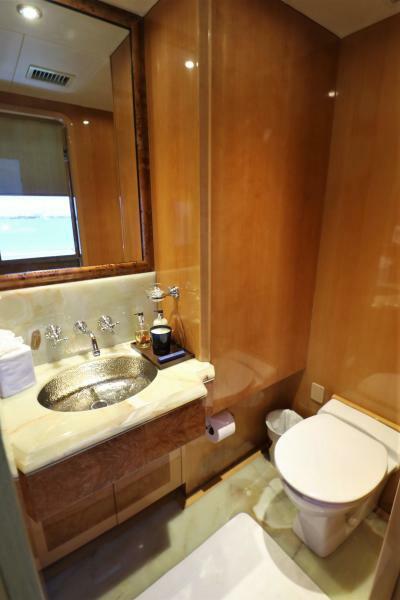 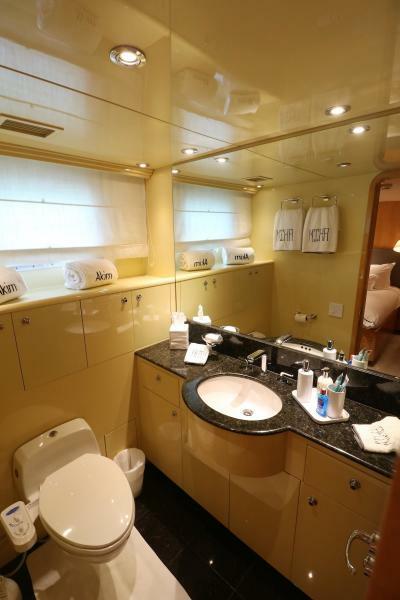 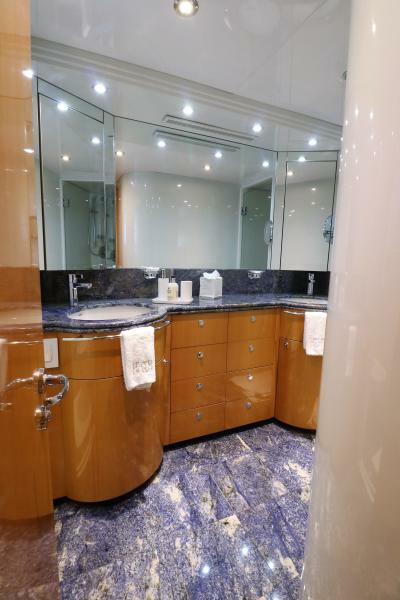 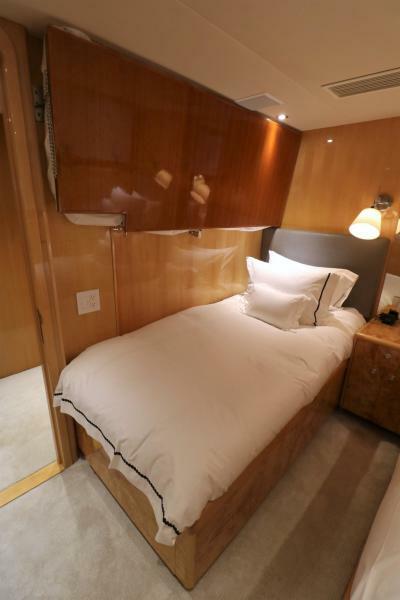 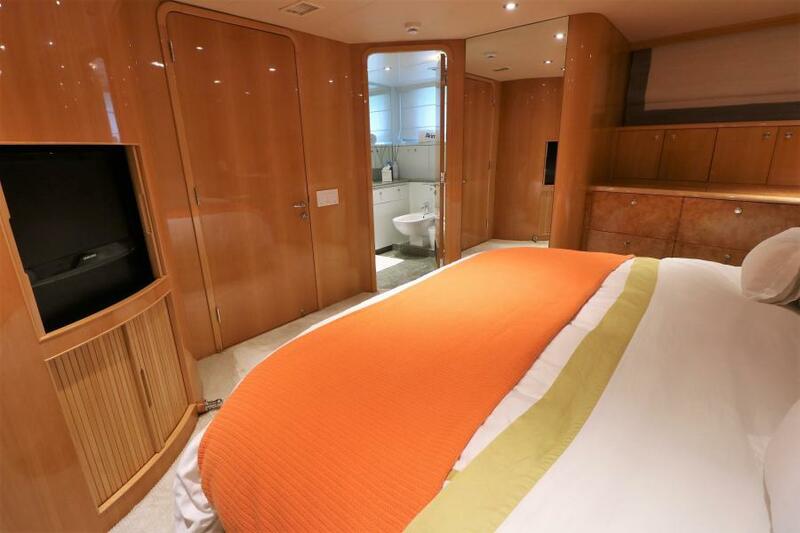 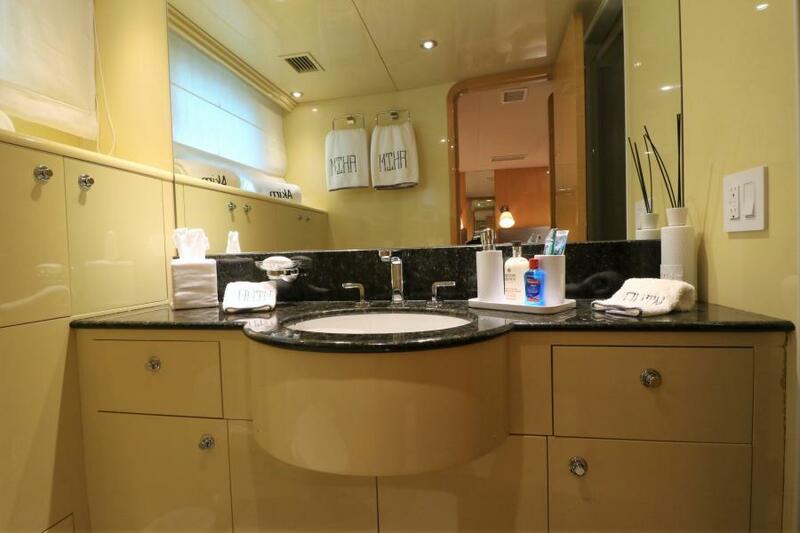 The Owner stateroom, located below the aft deck, features a king size bed with sofa (port side) and a dressing table, two hanging closets and a great bathroom. 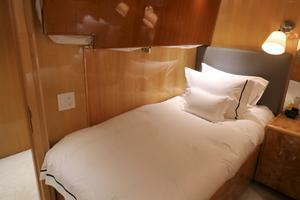 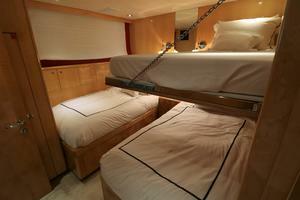 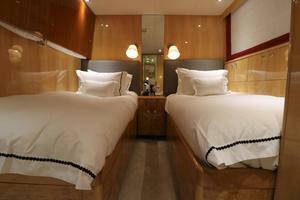 VIP stateroom is forward with a queen bed centerline, a sofa (starboard side), hanging locker and a private head. 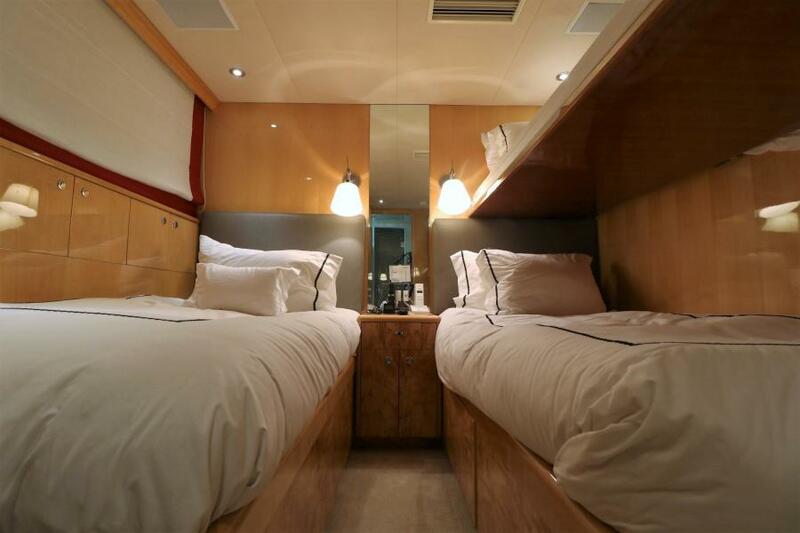 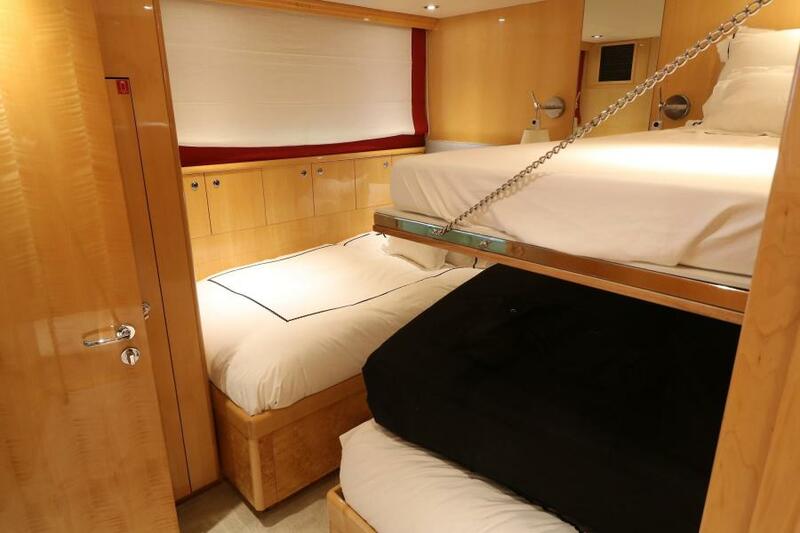 The Starboard and Port staterooms are mirror staterooms, have two single berths with one night table and a secret wall bunk bed, each room have a full head. 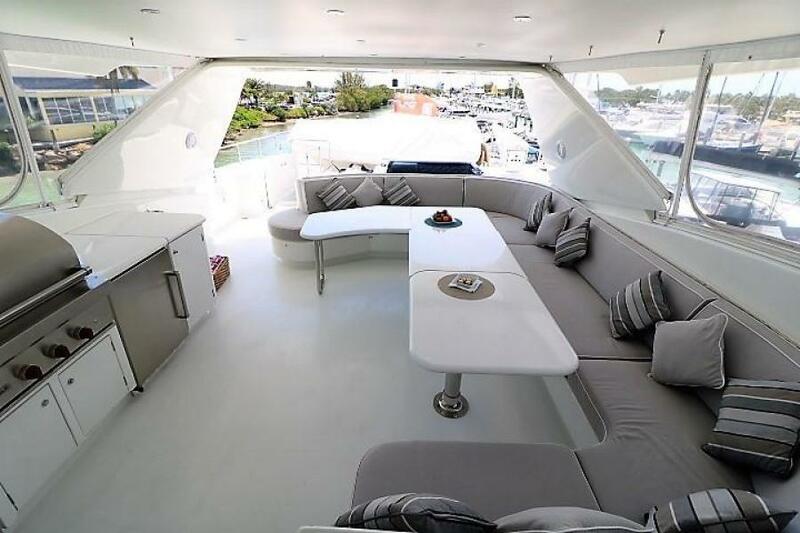 The Bridge has a two person seating that provides a great view. 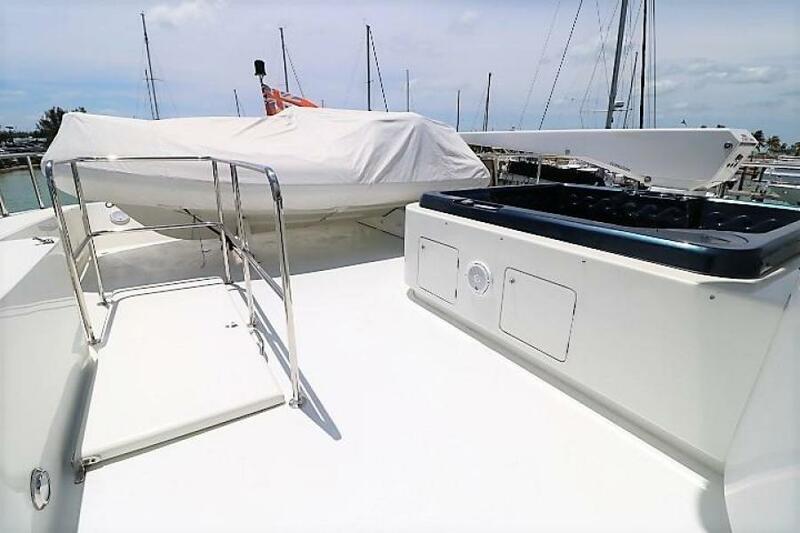 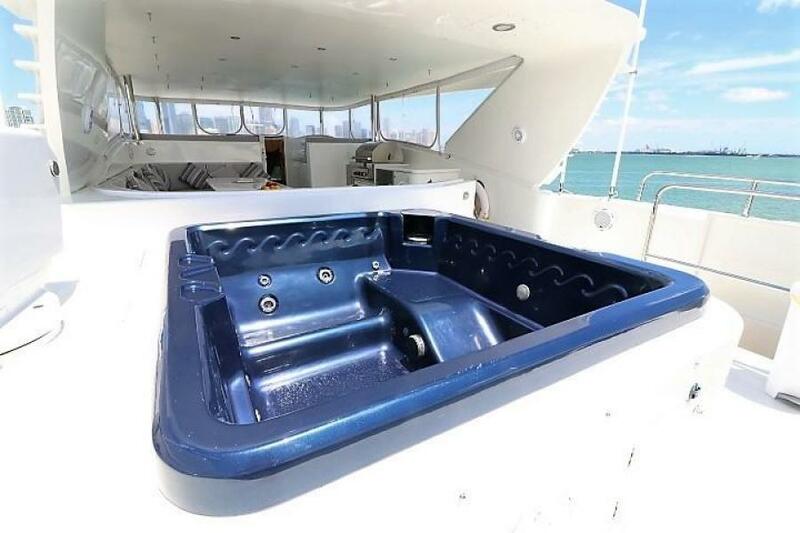 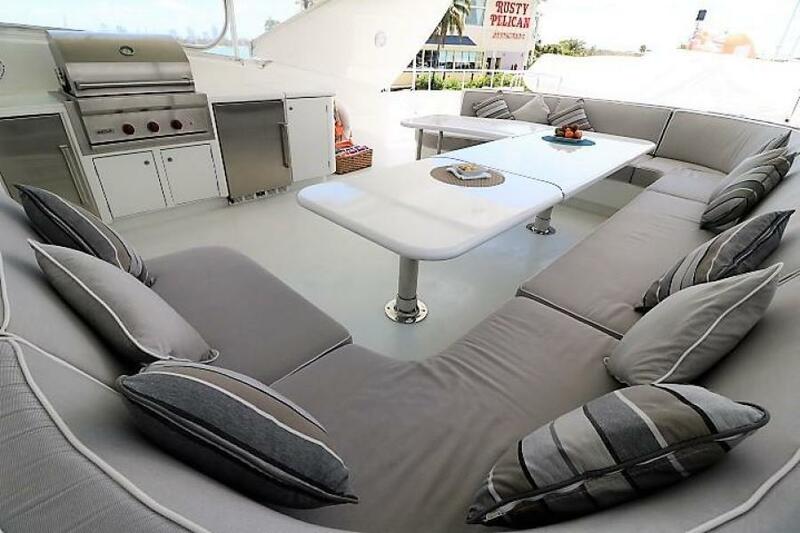 At the Flybridge is a large C-Shaped sofa, gas grill, sink, ice maker, refrigerator, eight speakers JL, canvas enclosure, the Dingui with Davit and a Hot Tube. 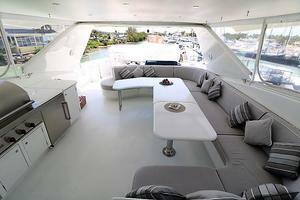 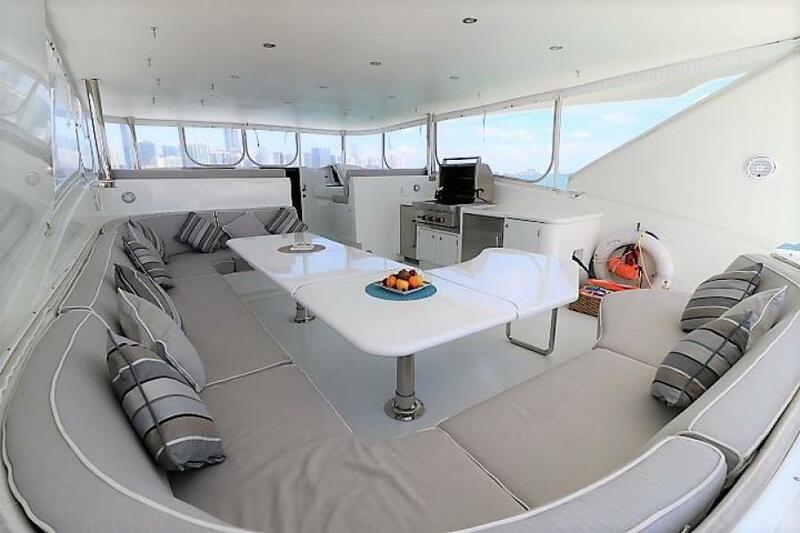 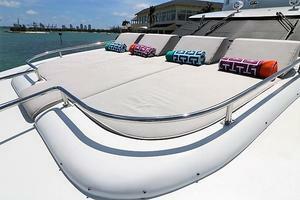 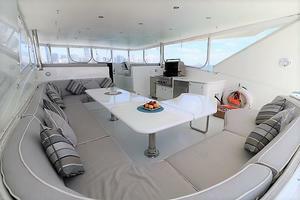 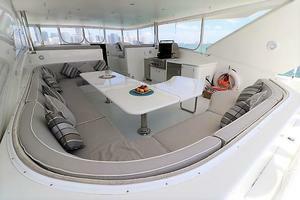 In the Bow area of the vessel can seat six people on a C-Shaped sofa and is a large sun bed. 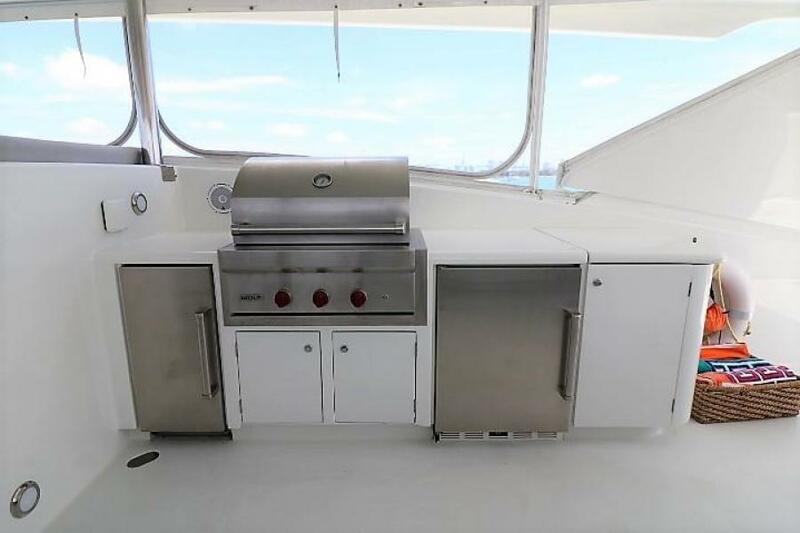 Also a big storage with refrigerator/freezer inside and speakers. 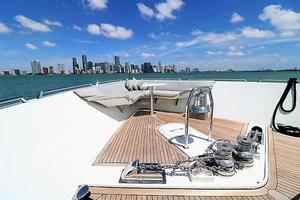 Great place to see the sunset and have a drink. 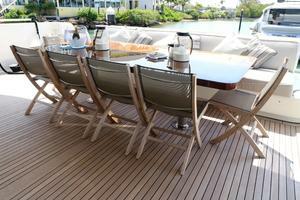 Ten (10) person seating Teak table. 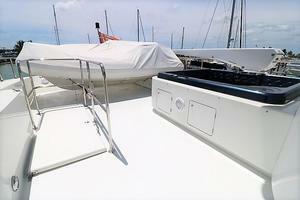 Port and Starboard boarding gates. 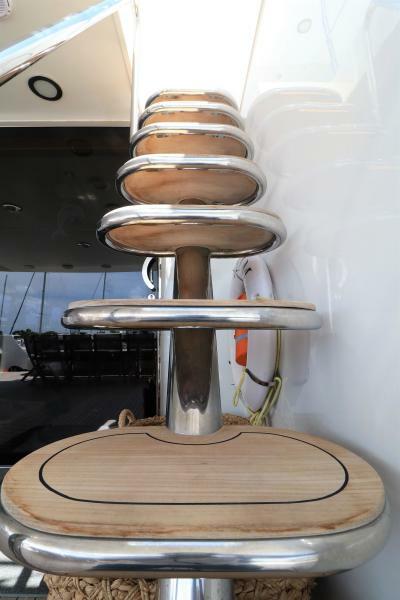 Four (4) JL Audio Speaker's. 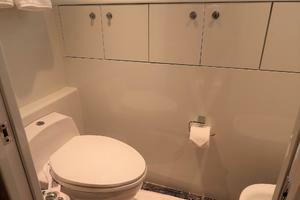 Sliding door access to Salon. 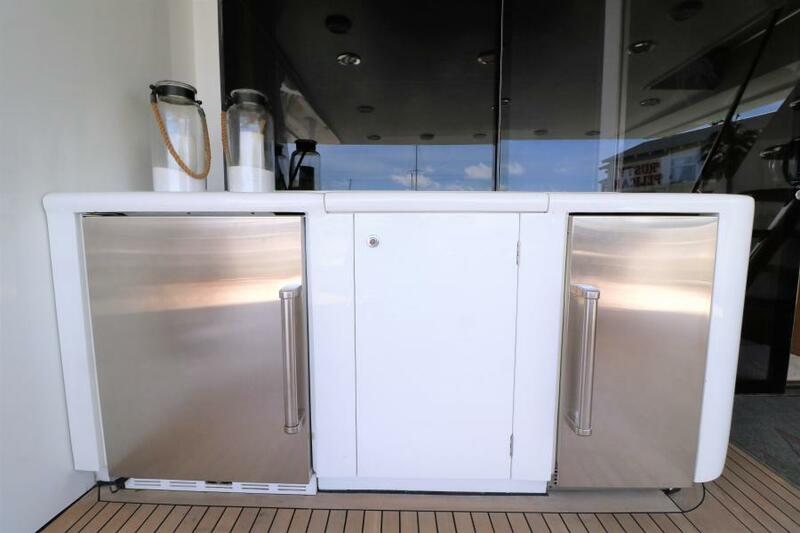 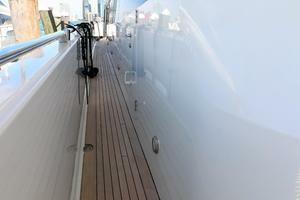 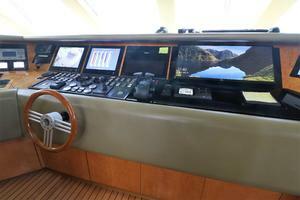 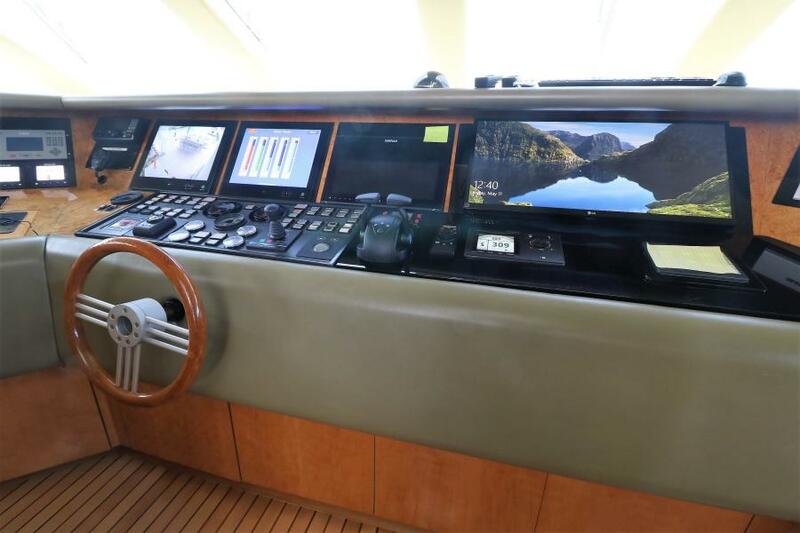 Sliding door acces to Pilothouse. 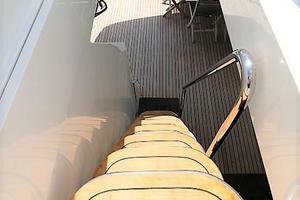 Teak ladder access to Aft Deck. 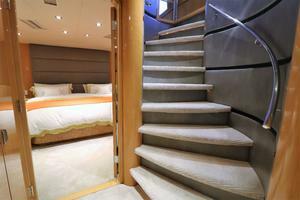 Eight (8) Speakers JL Audio. 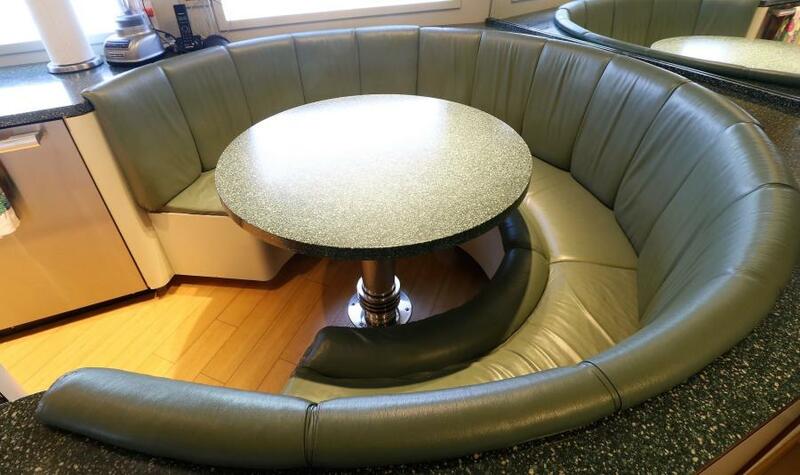 Ten (10) People seating Sofa, Chairs and Table. 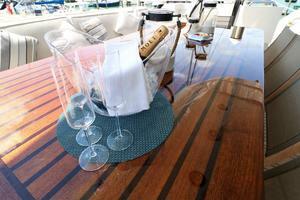 Deposit for cups and bottles. 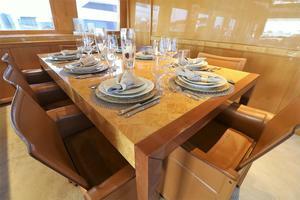 Formal Dining table for eight (8) people. Access to Pantry/Galley (Bow Port). 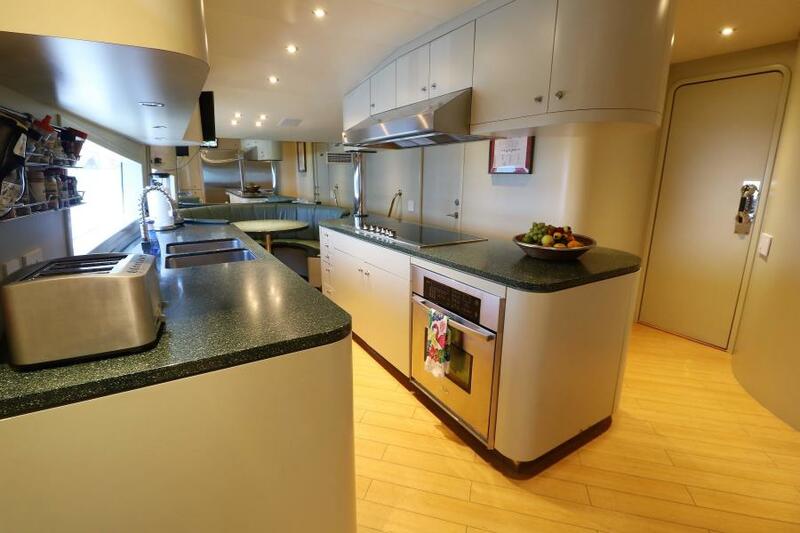 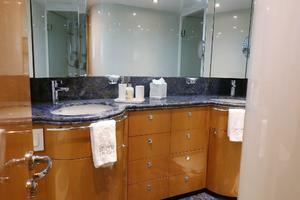 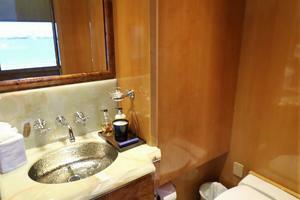 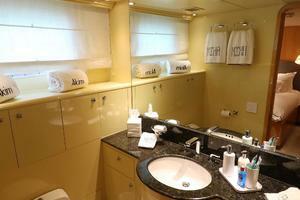 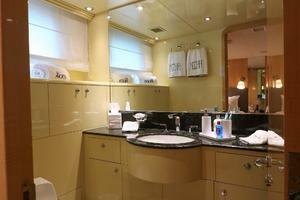 Access to Staterooms and Galley (Bow Starboard). 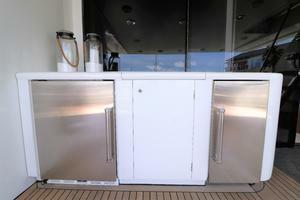 Freezer And Refrigerator Sub Zero. 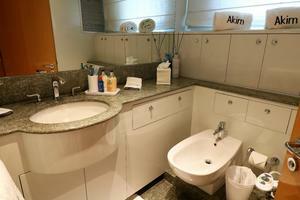 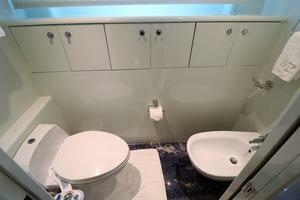 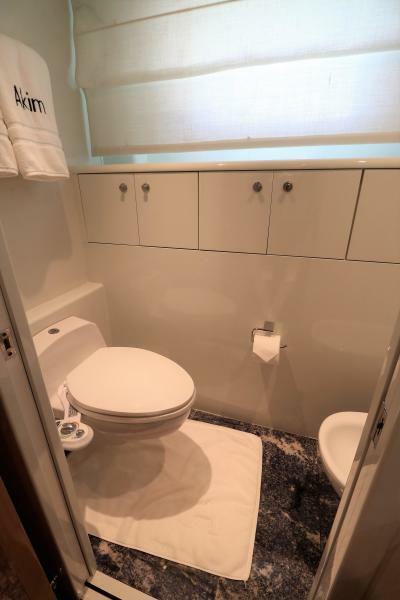 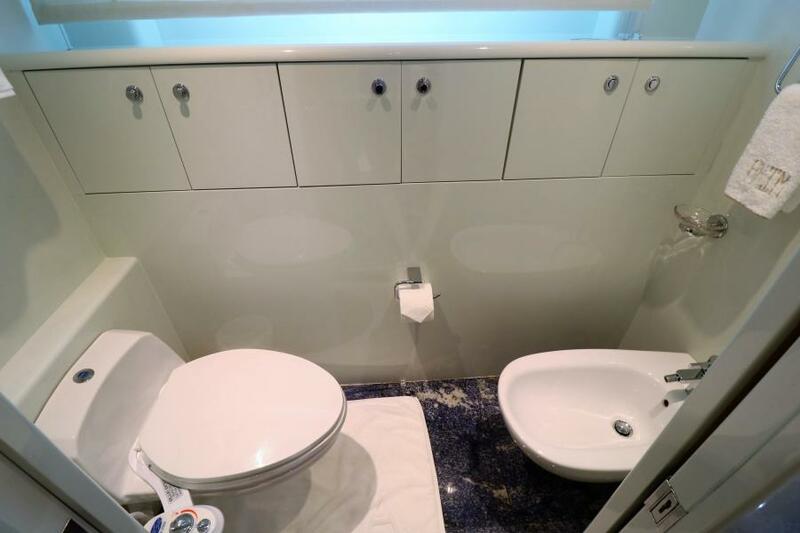 Toilet With Sliding Door And Bidet In The Same Area. 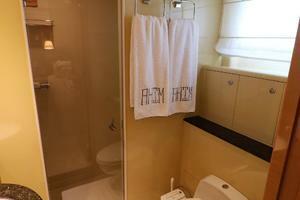 Shower (Glass Door) And Sitting. 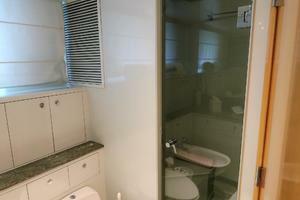 Shower With Glass Door & Inside Sitting. 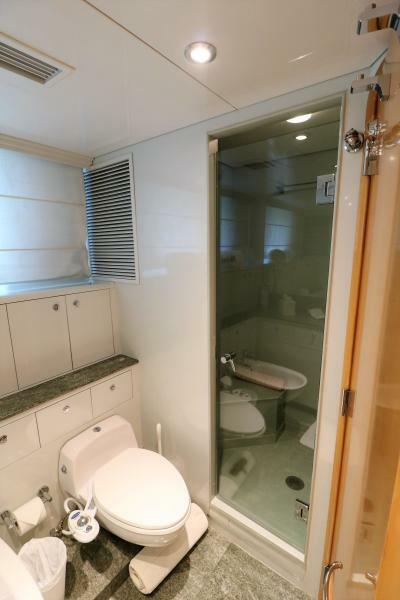 Shower With Glass Door & Sitting. Two (2) Deutz Engines (2,000 Hour's) Mayor Overhaul Made 2018. 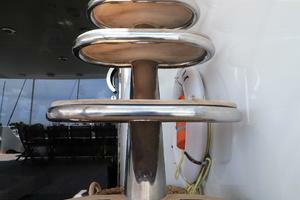 Two (2) Northern Light Generator 40 Kw (40 Hours).